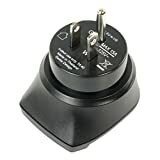 These adapters are suitable either for appliances purchased abroad or for when you have visitors turn up and find that they can't plug their electrical items into a US outlet. 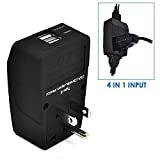 Whilst it is quite possible to buy country specific adapters it makes more sense to get a multiplug adapter that will be compatible with many different types of plugs. They're pretty cheap and many will convert most UK, European, Asian and Australian plugs to fit a USA outlet. The exception is the European Schuko plug which needs its own adapter due to the way that it makes the ground contact. Whilst an adapter will allow you to physically plug in an appliance it does not change the voltage or frequency of the supply. 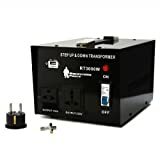 US voltage is currently specified as 120 V + /- 5% at 60 Hz. Please check that any appliances that you plug in are compatible. 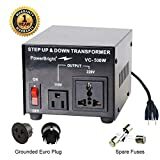 230 V Appliances (such as those made for the foreign market) are not likely to work properly (if at all) when plugged into a US outlet and it may cause damage to the equipment unless you use a suitable transformer. It is worthy of a mention as many Americans like to get hold of hi-teck devices that are not released onto the American market. Japanese voltage is 100V and many of their domestic appliances are set at that voltage. Because the USA runs at a higher voltage (all be it only slightly) these items may not function properly and could be damaged. The answer is to buy a special Japanese transformer.